There’s lots to see and do in northern Spain but if you’re tight on time, have a day to spare and want to see a truly amazing wildlife sight then here’s a day trip to Santa Cilia to whet your appetite. Just short of 100 miles from the airport at Zaragoza and situated in the beautiful foothills of the Pyrenees, Santa Cilia is a very small village in the north west province of Huesca in Aragon. Boasting golden stone buildings and a quietness that has got be heard, the village houses the interpretation centre of Fondo Amingos del Buitre (F.A.B), an organisation that is devoted to the local vulture population. Every day, members of F.A.B take out meat onto the nearby hills and witness a vulture breakfast. This providing of food is worth it just for the spectacle of seeing vultures feasting but it has a wider implication than just a tourist attraction. Due to human interaction with the land, farms have taken over wild grazing and in turn, dead domestic animals are disposed of in a safe, clean way. Great for us humans, but no good for the vultures which rely on carcasses to feed upon. F.A.B help out the vultures by feeding them daily. Cowboy movies always show the injured hero lying in the middle of nowhere, sun blazing down with vultures crying and circling overhead. As a child, I actually thought that the only way for me to see a vulture was to die alone, looking up at the sky in mid-west USA! And, to be honest, that didn’t really fill me with enthusiasm for the subject. Since then, I’ve seen a variety of vultures throughout the world and now understand that Britain is perhaps a bit unusual in not having them!! So, ok, what was going to be so special about this trip? Once you’ve seen a vulture…well, I’m not going to go all out to see another. Anyway, I joined a group of about twelve, with two guides, and trundled to Santa Cilia in a minibus. We parked up in a clearing along a dirt road just outside of the village and got out. We stood part way up a large limestone hill, part of the Sierra de Guara range which in turn is part of the southern foothills of the Pyrenees. The sky was deep blue, the heat starting to kick in and the first thing that struck me was the smell. The carpet of Wild Thyme was vast and alive with bees. The smell was gorgeous. If I knew how to bottle it, I would go back and do it! We had a briefing by Manu Aguilar, F.A.B co-founder and Teresa who manages the F.A.B museum and then began a short linear trek along the side of the hill. The Aragon countryside stretched out below us, vast and green. The sky began to fill with birds. Griffon Vultures began circling up above in front of us. There were only one or two initially then more and more joined in. Griffons fly in from over 200 miles away to feed at this site so they had come from Spain and as far afield as Andorra and France. Eventually there was a tornado of about 100 or more vultures right in front of us just above our heads. These are getting really close! The track became smaller, but no less manageable, winding its way through the sweet scented Wild Thyme until we reached a large sloping slab of limestone gleaming white in the sun. We were told to sit quietly at the edge of the slab by some shrubs. Manu, meanwhile, disappeared across the slab pushing a wheelbarrow full of meat and carcasses. No sooner as I saw him turn to come back to us, the Griffon Vultures came down. Some would do a fly by, swooping down and straight back up again into the tornado whilst others simply plonked themselves down on the slab by the carcass preparing to tuck in. They were at a nice distance as I could see them clearly through the binoculars. Manu came and sat down on the slab not far from me. And began throwing hens eggs out in front of him. Then, the Griffons began to drop down in front of us, to the side of us and swoop down over us. I was reliably informed by Manu that there were over 250 Griffons that day. I won’t argue with that. I didn’t think that I would be bothered by their size but in those numbers, I have to admit that I was a little intimidated!! In fact, they were so near that the zoom lens on my camera was too big to pick them out and the binoculars couldn’t focus. Grrr, I was changing lenses, looking up, looking down, looking out, ducking down! In the end, I put the camera and bins down and just enjoyed the spectacle. The Griffon Vultures way outnumbered the other birds present but there was a lonesome Egyptian Vulture, known for breaking open eggs with stones, amongst them. Disappointingly, the Egyptian did not show any signs of entertaining us by cracking eggs. He looked a little bit overawed by the Griffons. I knew how he felt! He was eventually joined by others and we saw six in total at the site. I watched a Griffon being mobbed by Northern Ravens below us, Red and Black Kites soaring, riding the thermals and Lammergeiers, waiting for leftover bones, majestically flying over our heads. However, it was difficult to take my eyes of the Griffons in front of me. Close up, they are huge and their beaks look deadly. I didn’t dare move. Then, I remembered that they eat dead stuff so thought that I best look alive! I had no intention of one of those beaks coming anywhere near me! They gobbled up the eggs and began to leave, running a few steps clumsily down the hill then launching themselves gracefully into the air. The slab became clearer as one by one, the Griffons flew off. Eventually, it was our turn to leave and we did, making our way back the way we had come. I was so pleased to smell the Wild Thyme again as it had been totally overpowered by the smell of vultures. For a clean animal, they certainly do stink!! Once back in Santa Cilia, we accompanied Manu and Terese to the F.A.B interpretation centre and museum. We were shown a film about the organisation then we had a look at the exhibition. It’s small and certainly no Disney (if that’s what you want, you’ll be disappointed) but the exhibits are quaint, well put together and explain the F.A.B message well. It feels like you are seeing the real Spain and not a commercial one. That’s how I like it! By now, it was late lunch-time. Don’t expect bars, cafes, restaurants and shops in Santa Cilia. It only has a population of just over 200 after all, so take a picnic. I highly recommend a brief stroll through the village. The interesting plant holders built into the walls and the architecture of the buildings themselves are worth having a look at and it won’t take long. Make your way a short distance to the village mirador, a roofed open sided building providing a viewpoint over the mountains and back towards the vulture feeding site. It is situated at the back of a small park and is useful to use as a picnic stop (remember to pack some excellent local Spanish wine!). The roof is particularly welcome in the searing heat. If you are lucky, the Lammergeiers will still be picking at the bones. It’s a bit far to see just using binoculars but a scope will pick them up well. When I was there, two Lammergeiers were still scavaging at the site. I am so glad that I saw the vultures and that I didn’t die in mid-west USA doing so. I loved watching them gather as a tornado then disappear one by one calmly, gracefully and with a full belly! If you are not super-fit, doing something spectacular like trekking over the Pyrenees to Santa Cilia, like me you will need some transport as public transport is thin on the ground. There are many wildlife tour companies that travel to northern Spain from the UK. 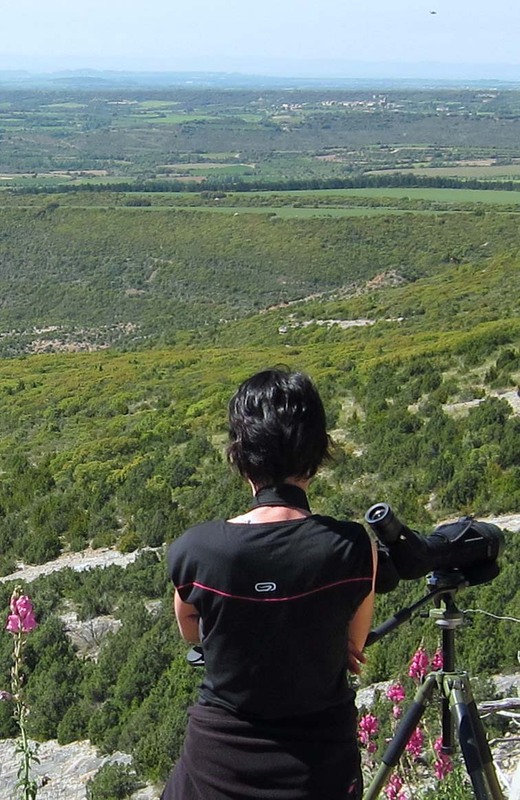 I travelled in May, as part of a group, spending a week with wildlife holiday company Naturetrek www.naturetrek.co.uk. I do recommend this group route however should you wish to experience the F.A.B vulture feeding station independently then contact them directly either through the website at www.fondoamingosdelbuitre.org or via their Facebook page, to arrange such a visit and agree prices. My trip was all-in as part of the tour but our group collected and gave a donation. Remember that F.A.B is a charity. All that meat cannot be cheap so any donations are always welcome. And then there was one…..